Located just off of I-90/94, Outlets at The Dells (formerly Tanger Outlets) has over 50 popular brand-name outlets to shop. 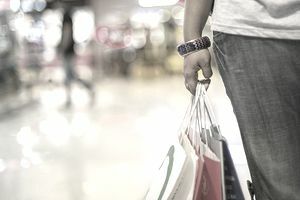 Along with great shopping choices, visitors can get money-saving coupons for select outlet stores and take advantage of extra savings during the outlet mall's sales events. I have not personally shopped at Outlets at The Dells, but after reading several reviews from TripAdvisor.com, Yelp.com and Google Reviews, it seems that most shoppers are fairly satisfied ( 3.9 stars) with the selection of stores even though the mall is smaller than most outlet centers. As for the prices found in the stores, several shoppers commented on finding good deals in some of the stores, but a lot of shoppers did not feel that the prices were low enough compared to what they found in regular retail stores. The stores that were mentioned for having the best deals included Talbots, Old Navy, Nike, Under Armour and Rue 21. The large majority of shoppers described the outlet mall as being clean and the mall and store employees as being nice and helpful. Not much was said, pro or con, about food choices at the outlet, but there are several good restaurants that are very close to the outlet mall. Many shoppers commented on how the outlet mall is designed. It is considered an outdoor mall, but the shopping area is covered with an "open ceiling" which does offer some protection from the elements, but still lets in the cold air. The outlet has heaters that hang down from the ceiling, but many shoppers complained that they were not turned on, even though it was very cold. Based on the reviews, it seems like it is a pleasant outlet center with a good mixture of outlet stores and worthy of pulling off the highway to go and shop. The best place to find coupons is on the Outlets at The Dells' "Sales" webpage, which has up-to-date coupons and sales information for the individual outlet stores. For additional savings, visit the customer service desk and get a complimentary Outlets at the Dells VIP Savings Card. For more printable outlet stores' coupons, visit the Wisconsin Dells Vacation Guide and scan the Deals webpage for individual store coupons. Visit the "Events" webpage on the Outlets at The Dells website for additional information. Also, check out the Outlets at The Dells Facebook page for additional information on sales and events. For information on store hours for a specific holiday, visit the Outlets at The Dells Center Hours webpage. Take I-90/94 West to Hwy 12 (Exit 92). Follow ramp to the right and travel .three miles on Hwy 12W and 23N. Take a left at first traffic light on Gasser Road. The outlet is located .three miles on the left. Note: Please visit the Outlets at The Dells directory for the most current store listing and store phone numbers.